Yooo... its been a while since i updated the blog.. and i guess i should continue to do so... so lets just get it going... and not waste time explaining why i missed so many updates... 3 yrs in fact.. hehehe... so i guess there are many things i could talk about... but lets leave that for a later part..
Winter is round the corner and as usual snows tires are a must for our daily drive vehicle. The front tires thread were nearly to a pt where it was time to replace these. These tires have been used for the last 5 winters.. and i would say its about time to change them out. As my rears were studded FireStone Winterforce, i initially wanted to get the same brand but decided to go with the Nokian Hakkapeliitta 8 Studded. These are the best winter stud tires in the mkt and it cost me nearly $200 a pair just to have the old tires removed , new tires installed and balanced. Found this company called Anywhere TireCare.. and cool they will come to you wherever u are as long as its 40 miles within Albany locality. .. i was a tad embarrassed as the initial appt was 3pm and i came home at close to 320pm .. apologized to the guy and he said not to worry... and got about doing what he was here for. after 20 mins .. i was all set.. my front are studded snows too... and now officially i have the noisiest car in the estate. My scope rings finally arrived for my AR and quickly mounted up my Nikon Prostaff Scope (ProStaff 3-9x40 Matte BDC) which i bought 2 pcs at $99 per pc during the recent Black Friday sales at Dicks Sporting Goods.. Cabela's also had the same deal at the same price. Yes... for those who do not know.. i have quite a fair number of firearms and also a Pistol permit which allows me to own pistols / Handguns. I will talk about those later.. but i am in the process of getting a CCW Conceal Carry Weapons Permit to body carry my pistols with me when i am outside in public concealed. 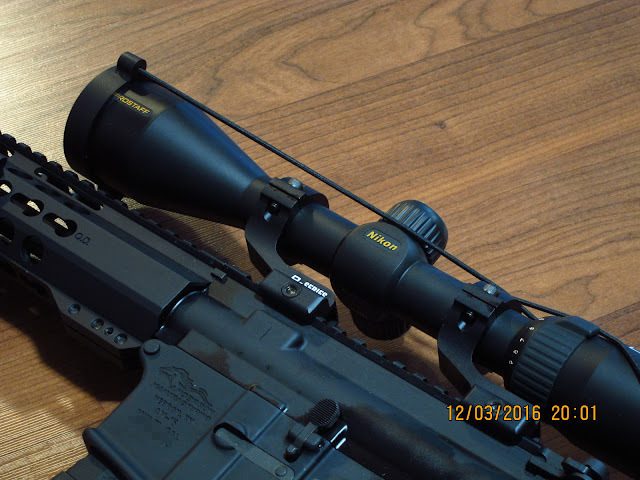 Some pics of the Scope mounted on my .223 AR15. This rifle was a good price and i paid nearly $500 for the whole built. Self built this baby up with a Anderson Lower Receiver and a PSA upper receiver kit. the rear steel bumper plate... see that rusted section... i hate rust!!! onto the basement again... completed the framing and drywall of the closet area also completed the storage section doorway..